Hear ye, hear ye! Her Royal Highness Princess Charlotte Elizabeth Diana of Cambridge arrived last Saturday and as to be expected, the world is still buzzing about her grand entrance. After much anticipation, the news of the little bundle of joy spread quickly and social media nearly exploded with the reveal that William and Kate gave birth to a beautiful baby girl. 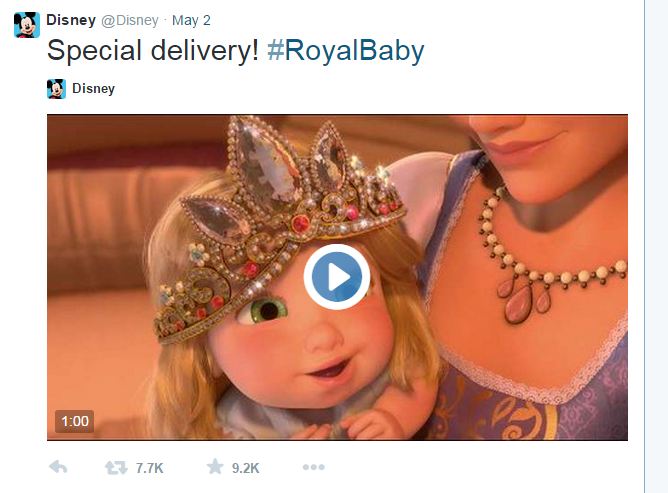 The tweet sent by @KensingtonRoyal announcing the birth, “Her Royal Highness The Duchess of Cambridge was safely delivered of a daughter at 8:34am” was retweeted 47,000 times and favorited 42,000 times. Not only did the announcement garner over a million tweets, but the conversations peaked at 4,500 tweets per minute around 11:34am according to Twitter. According to the DailyMail, “Hashtracking reveals that the majority of people posting about the baby were women (61%) and the highest proportion of tweets were surprisingly sent from the U.S. (23%). The announcement of Princess Charlotte’s birth topped the arrival of her big brother as she received over 1 million #RoyalBaby tweets while Prince George’s birth generated only 900,000. 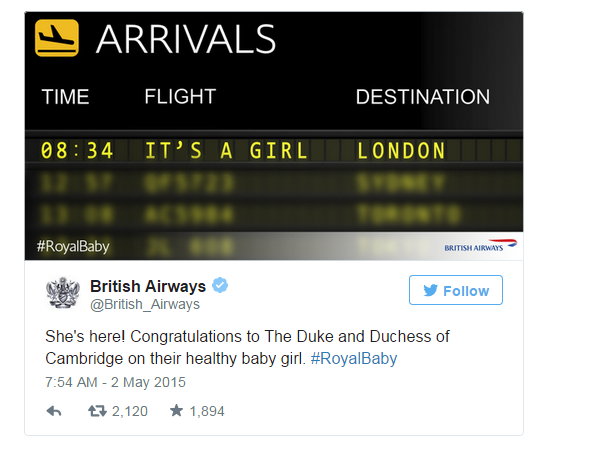 The tweet revealing the name, “The Duke and Duchess of Cambridge are delighted to announce that they have named their daughter Charlotte Elizabeth Diana” was shared and favorited more than 92,980 times. 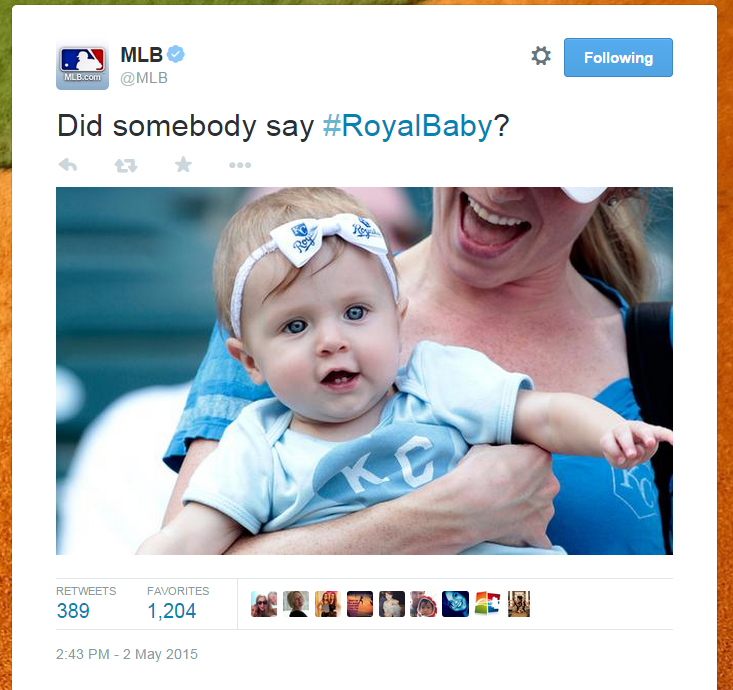 More than 300,000 tweets mentioning ‘Charlotte’ were made following the name confirmation. 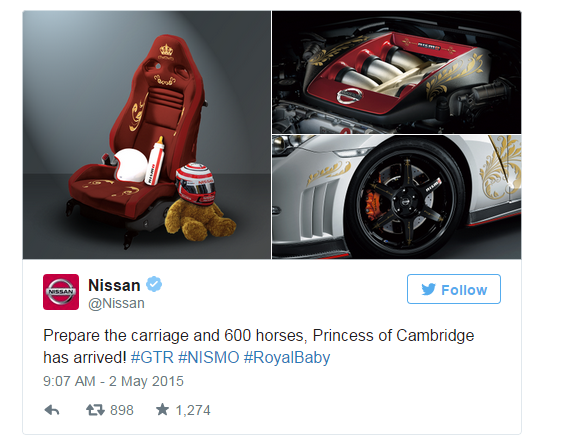 I loved seeing all of the baby banter that has been going on and loved that many brands used this real-time event to engage their followers. This is a great example of brands thinking outside of their “strictly promotional” box and coming up with creative ways to stay relevant in the conversation. 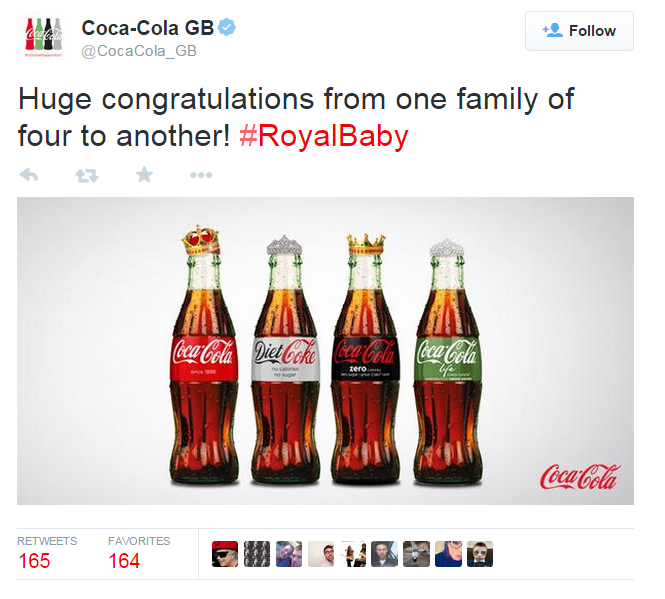 Did you join in the Twitter-chatter about the #RoyalBaby? 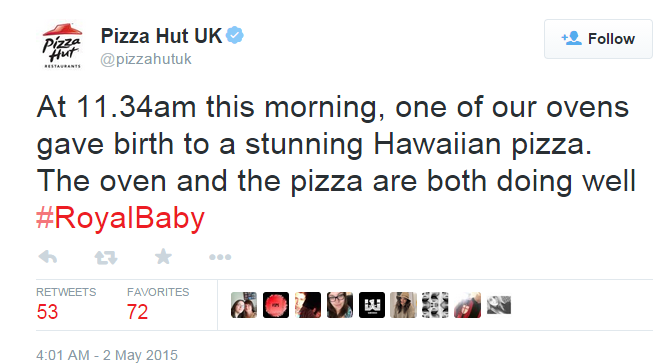 What did you think of some of the brands that joined the baby conversation? Due to my obsession with the show, I recently read an article on Inc.com that recapped a speech that business mogul and Shark Tank star, Daymond John did during an Inc. GrowCo conference in Nashville and I wanted to share some of his wisdom. I find John’s story to be the most inspiring out of all of the sharks and applaud him for all that he has accomplished. For those of you who are unfamiliar with John, he created a clothing empire that started with his handmade line, Fubu. John is the epitome of a rags-to-riches story as he was raised in Queens by a single mother who worked three jobs to provide for the family. Using the sewing skills his mother had taught him, he started making clothing in his mother’s apartment and selling it on the street. After a lot of hard work and hustling, sales for his hats and shirts took off and today he is worth over $250 million dollars. Act bigger than you are. “John realized early on that although he knew he wanted to be a part of hip-hop culture, he couldn’t sing, dance or produce music. But he loved fashion. Dominating the hip-hop clothing business became his one and only focus. “I couldn’t hit a target I couldn’t see,” he recalls. The only problem was that he had no money and no knowledge about how to start a fashion company. So he did what many enterprising entrepreneurs have done before him: He faked it until he made it. The first step was getting the right people to stand behind the brand. Win on scrappiness and savvy. “John eventually learned that anyone who is anyone in the fashion business needs to show up at the annual Magic Show in Las Vegas, a trade show for clothing manufacturers. He couldn’t afford a booth or even a ticket. So he and a few friends turned a room at the Mirage hotel into a makeshift showroom. John sneaked into the convention and persuaded buyers to make a trip over to the room. By the end of the show, he had closed $300,000 in orders. Fubu later went on to sell, with the help of a distribution deal with Samsung’s textile division, $30 million of clothing in three months. Remember: You are the brand. “If you’re an aspiring Shark Tank contestant, this tip is for you. John says one of the most important things you can do to set yourself up for success when you pitch your company is to come up with two to five words that define you as an entrepreneur. “If you don’t know what you stand for, you leave it up to us,” he says, referring to the other sharks on the show. I think John not only offered some great insight, but also some incredible inspiration for the aspiring or up-and-coming entrepreneurs out there. He defied the odds and truly created his own success by following a dream, working hard and taking advantage of the right opportunities. What did you think of his tips? I welcome your comments and as always, if you like what you read be social and share. Just like anything else in life, first impressions are extremely important especially when trying to make your logo aesthetically appealing to your audience. A good logo will trigger positive emotions in your mind and is more likely to create brand loyalty while a bad logo will do the opposite. A good logo has to work well on a number of different platforms including the web, collateral materials and ads and this is not always something people account for in the planning process. The font should be balanced and readable at any size. Also, don’t forget about choosing the right colors. A full-color logo may not translate well to B&W or print as well on different types of paper so keep that in mind as well. This year’s Major League Baseball Spring Training is one for the record books and one player is sure to go down in infamy for pulling off one of the most bizarre antics in baseball history. On Thursday, this player was traded to 10 different teams and played 10 different positions during five games in the span of one day. However, this was not your average professional baseball player. This type of accomplishment could only be pulled off by the man, the myth, the legend, Will Ferrell. The comedian/actor laced up his cleats and hit the baseball field in a stunt of epic proportions to defy the odds of baseball, honor baseball legend Bert “Campy” Campaneris and most importantly, raise money and awareness for the fight against cancer. Thanks to the brilliance of HBO and Funny or Die, Ferrell played all 10 positions (including DH) for 10 teams in the Cactus League in Arizona as part of an upcoming TV special that will air later this year. Relying on cars and “choppahs” (helicopters) to get from game to game, Ferrell managed to go 0-2 (2K) with one foul tip on offense, he also intentionally walked one batter while pitching, skillfully coached third base with awesome signs, grew an impressive beard and was traded for a Churro Dog and a D-bat Dog. Prior to the games, Ferrell said that he felt confident going into the day and that “these teams need a clubhouse presence and my presence is a flabby 47-year-old guy that doesn’t know how to play. But I have life experience and I’m willing to do whatever it takes to get the job done,” during a pre-game(s) interview with ESPN’s Mike & Mike. Not only did Ferrell pull off this crazy stunt, it was all documented via live-tweeting with the hashtag #FerrellTakesTheField. “GAME ONE: Ferrell kicked off the first game by playing shortstop for the A’s. However, his time with the team was short, as he was traded to the Mariners almost immediately. “The A’s announced that Will Ferrell has been traded to the @Mariners for a CATBNL (Comedic Actor To Be Named Later). #FerrellTakesTheField,” the Mariners announced on Twitter. He played second base for the Mariners. As a kid, Ferrell rooted for the Angels, “before they became the L.A. Angels of Anaheim, Adjacent to L.A., Just Southern California, South, North of San Diego Angels,” he joked. He kicked off game two playing for his hometown team, taking center field in place of Mike Trout and during his time on the field, successfully fielded the ball. Afterward, he was traded to the Chicago Cubs, where he played first and coached third base. Ferrell also batted, though he struck out! In a blockbuster trade, the Arizona Diamondbacks acquired Ferrell from the Chicago Cubs in exchange for two specialty hot dogs — a Churro dog and D-Bat dog — before playing Cincinnati. It’s unclear if the hot dog he was later seen eating was one he was traded for. Ferrell lined up in left field for the Diamondbacks. Ferrell was later traded to the Reds and suddenly grew a lengthy grey beard. He played third base for Cincinnati. Ferrell was on the move again later, arriving as a member of the Chicago White Sox via helicopter. He struck out as a White Sox player and was quickly traded to the San Francisco Giants. As a huge Will Ferrell and baseball fan, I loved this stunt and that fact that it raised money for a great cause. Some view the game of baseball as “boring” and I think this spiced it up a little and showed the MLB as an organization may not be so “old school” as many previously thought. While I understand how some view the stunt as “disrespectful” to the game, I think because it was raising awareness for a good cause it was totally acceptable. After all, this was Spring Training not Game 7 of the World Series. I also loved the social media updates from all of the teams involved and hope that baseball as well as all professional sports organizations can take advantage of opportunities like this to generate awareness and give back to charities that need help. What did you think of this stunt? Did you find it funny or disrespectful?